First off I would like to say that I am very upset that you didn’t let me know about this post. I had to find out about it from people "defending" me. Considering we have spoken before I think the least you could’ve done was to let me know you had decided to continue the conversation in blog format. 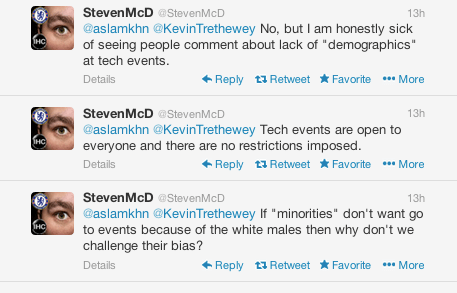 Quote 1: "By the way, Steven, as a white male, you are the minority." Yes I am in the minority in South Africa and maybe even Africa in general. Since the internet knows no boundaries I generally focus on our profession as a whole and not where we are located. Looking at developers worldwide, white males seem to be in the majority. This is very apparent by the recent rise in discussions/dramas taking place where "internet activists" are pushing for more acceptance for Woman and the LGBT communities at conferences. When I look at developer meetups, tech discussions online and conferences I see more white males than other race/gender groupings. It could be that I am seeing my world through my bias but that has been my perception in almost a decade in the industry. Quote 2: "For example, I know a few black software developers that don’t live in a conveniently accessible middle class suburb. For them, getting to work is a challenge"
I don’t live in a conveniently accessible middle class suburb. I live almost 100km from where most tech meetups are held. I have a wife and 2 children at home. I need to plan ahead to attend events, talks and conferences. I agree that "Our lives are not equal in far more fundamental ways than we wish to acknowledge" BUT that is where dedication begins. Planning and thinking ahead is part and parcel of being an adult and a professional. Granted arranging transport can be a pain. When I didn’t have transport to several dev events I asked around and I arranged transport. I met up with people to get a lift to more than one event. If a professional is supporting their entire family on an income, is it not in their career’s best interest to invest time in bettering themselves? Code Retreats and UserGroups are generally free and they are the best networking tool there is. 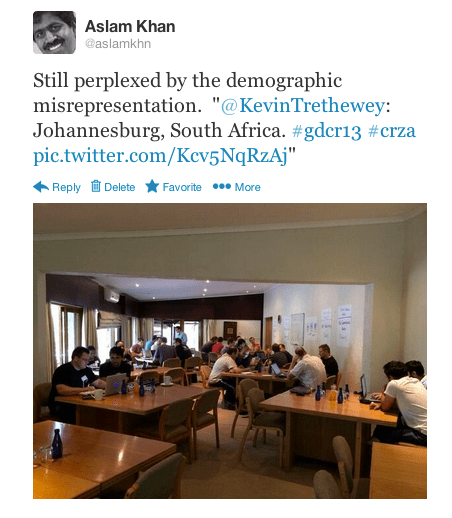 I would love more tech events in the South and/or East of Joburg and I’m trying my hand at organizing in 2014 so I am not only talking about it here, I am actively looking at implementing it. Quote 3: "Parallel to this, we need fair and equal gender representation too. South Africa has one of the most humane constitutions in the world. Yet, I see many software developers adopt the non-inclusive behaviour of frat boys, country clubs and colonial style thinking of the west and north." What? I don’t know which software developers you hang out with but I invite you join us at JSinSA or even a normal Dev UserGroup when you Joburg again. I have never seen this or heard of this. We’ve had non tech people join us at the dev usergroup and they were part of the conversations. If someone is acting like a jerk then call them out on it! I’ve had many friends from different race/gender/religions join us at various events and not once have I heard a complaint about exclusion. Quote 4: "Simon rightfully points out that the lack of diversity is common….. that it is so does not mean that we should accept this." Okay, so let’s not accept that lack of diversity is commonplace. DONE! What did it achieve? Nothing. We can moan and complain as much as we want to about lack of diversity, BUT until someone can bring a solution to the table the moaning and complaining does nothing but cause negativity. This whole conversation started because you were perplexed by the demographic in the photo taken by Kevin at the CodeRetreat. There is nothing to be perplexed about here. Those humans (as Kevin pointed out) made the effort and planning required to attend the event. Another quote was "A point to note here is how quickly people focused on racial composition as opposed to gender composition of the group" in the introduction. I didn’t gather that from the tweets on the day but you may have received comments/tweets that I didn’t see so I will give you the benefit of the doubt there. Quote 5: "Yet, there is a strong element of intimidation. This, we cannot ignore." I’m sorry that you were on the receiving end of intimidation from someone, I haven’t encountered this at a tech group but whether that intimidation was based on your race I wouldn’t know. Either way it is not acceptable and I hope you took it up with the organizers of the event. To say there is intimidation at all events/companies is a very strong and irresponsible thing to say and I’m quite shocked that you would generalize like that. Finally! Quote 6: "And if you want to plug-in to this inclusive, humane culture, then you will need to plug-in to yourself first"
Thanks for your comments. It helps take these important matters forward. That you share your thoughts openly means that we make progress. So, once again, thanks for that. You asked for clarification of what I mean by "plug-in to yourself first". It is not combative at all. It is clarified by my last statement: "I can only behave in a way that I want (others) to behave". If I want to people to live without prejudices, then I must drop all my prejudices first. If I want to help someone be a better developer, then I must be a better developer first. Like I said, I’ve found this to be a difficult thing to do and the consequence of not doing this is that I run into value-system conflicts because I am unclear of my own values. Most time when I think I’m being empathetic, I discover I was just touching the surface. I remember that we first encountered each other online after you heard me interviewed by Scott Hanselman years ago. In that interview, we spoke about diversity and the philosophy of ubuntu in software development. This is the same topic. We are making progress, and that is good. But we are very far from where I want to be. For me, this is of national and continental importance. Maybe it is not that important for the majority of our community. I don’t know but time will tell. Good luck with all your initiatives. If there is any way that I can help connect you with people that you would like to invite to these events that you are planning, please do not hesitate to ask, and I will try my best.